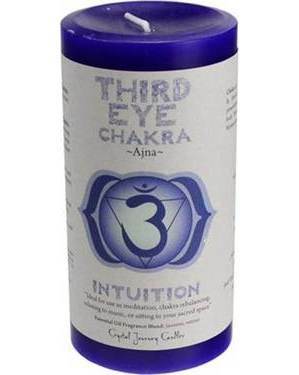 The Ajna or Third Eye Chakra is the 6th chakra in the chakra ladder. It is located between the eyes and behind the forehead. It is associated with the The Penal and Pituitary Glands, the eyes and ears, as well as the cerebrum and the rest of the nervous system. This indigo (dark blue) pillar candle made by Crystal Journey Candles is dedicated to the Third Eye Chakra, stands 6 inches tall, and is 3 inches in diameter. It comes with a removable paper label that contains detailed information on the Third Eye Chakra and it's energy. Please remember that the PAPER LABEL MUST BE REMOVED BEFORE LIGHTING!